Weight management, lifestyle changes, and health transformations are just a few reasons people find our company. Sometimes it's for a loved one, sometimes it for themselves. We cater to the individual. 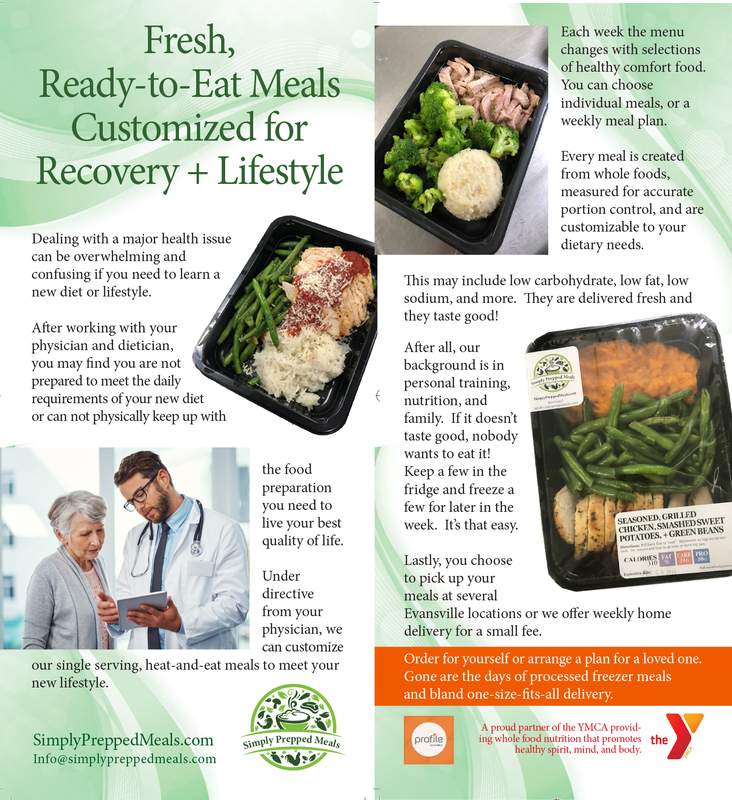 Because our meals are made from whole, unprocessed foods, we can customize to most concerns such as low starch, high protein, low calorie, low sodium, and more making us ideal for those who aren't able to prepare meals themselves or don't have the time. We even offer home delivery if pick-up at our Evansville locations isn't an option. Choose from a weekly auto meal plan (10 meals a week, your choice), or choose individual meals each week (as many or few as you'd like). Each meal has a customizable 'notes' section. Download our health + wellness brochure here. Get our weekly menu and updates in your mailbox! I WANT TO PICK UP TUESDAY... Order by Sunday night. I WANT TO PICK UP FRIDAY...Order by Wednesday night. I WANT HOME DELIVERY...Home deliveries are on Wednesdays, morning or evening. Order by Monday night. All entrees can be altered to be Profile friendly as well as low carb. - Blackened chicken, coconut sugared cinnamon sweet potato, and broccoli. Hosting a health fair? Maybe you have a wellness week? We love visiting offices and social groups! We talk about healthy lifestyles, incorporating exercise, meal prep, and how to make lasting changes. Fill out this form and we will contact you to get you on the calendar. *Please note - some times of year are busier than others. If considering September-October and December-January, please book as early as possible. We love to cater your office events! We've become known for our mobile salad bars! We also do hot catering as well. Download the pricing sheet and contact us. We will have you all set in no time!